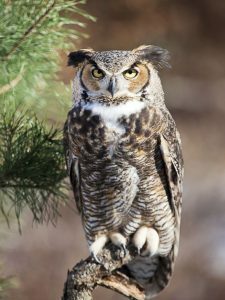 Great horned owls are some of the tallest owls in North America reaching the maximum height of 63 cm. They are just about the height of a knee roll but they have pretty powerful claws and talons. 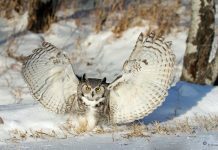 On an occasion great horned owls are thought to prey on skunks and porcupines although they sometimes end up getting injured. Snowy owl is only slightly taller than the great horned owl. 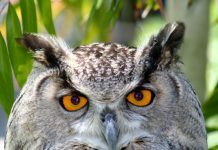 According to the Cornell Lab of Ornithology the height of adult owls’ ranges from 46 cm to 63 cm. Females are obviously taller than males. The tallest female owl can stand just above 2 feet in height. This isn’t a bad height at all especially for a bird of prey. 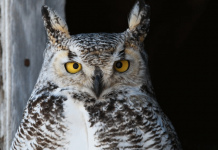 Thanks to their size, great horned owls do not have many natural predators in the wild. 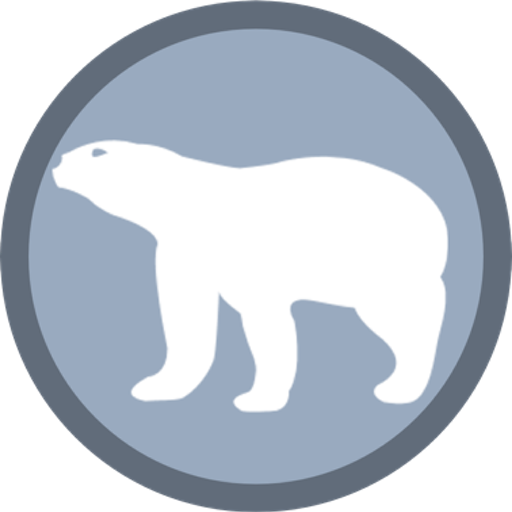 Furthermore, they have exceptionally varied diet precisely due to their size and the fact that they can afford to take on any prey they want. Great horned owls are nearly four times the height of a northern pygmy owl—the world’s smallest owl. Thus, it seems reasonable to assume that many owl species doesn’t stand a chance against an owl such as this.